Celebrate Hispanic Heritage Month with the Marcel Portilla Band, presented by the Peace Center in collaboration with the Hispanic Alliance. 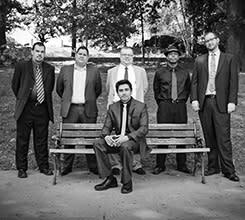 The Marcel Portilla Band plays a fusion of new Latin, tropical, and reggae in a way you have never heard before. Hailing from Colombia, Ecuador, Puerto Rico, and the US, they blend sultry Latin rhythms with modern pop tunes, rhythm and blues riffs, and quaking rock arrangements all into a must-see high energy performance. Led by South American singer/songwriter Marcel Portilla the band uses music to spread a message of diversity, love, and peace. They perform originals like “Amor Electronico” and “Amarte a Ti” and blend classic dance and club covers from hit artists such as Juanes, Carlos Vives, Oscar de Leon, Marc Anthony, and Ricky Martin.